JD BizX is well designed, inventive multipurpose one page Joomla! template by Joomdev, supremely a great choice for agency, startup, blogger, product landing page, and multipurpose business websites etc. This creative Joomla template make your site development easier, and gradually enhance your site’s look. The sensational Joomla template comes with dark and light layout that make it more convenient for you to design a website according to your needs. It’s time to show your creativity in your work with this responsive one page Joomla template. JD BizX based on Helix Ultimate framework and robust Quix page builder pro for easy customization. JD BizX Joomla Template comes with drag and drop page builder integration which makes it easy to edit and customize theme layouts. So instead of spending too much time to develop a Joomla site, spend your precious time to develop your business. 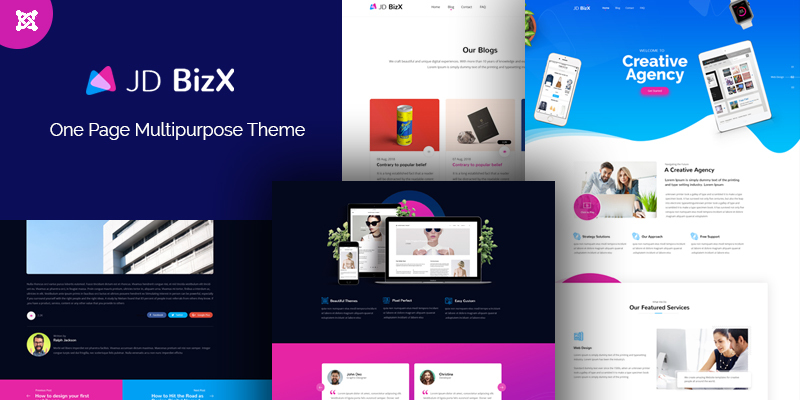 JD BizX template developed with latest Bootstrap 4 framework which extend its flexibility and functionality and has a powerful admin panel from where you can control all the basic settings like logo and preloader to advanced likes layout builder, CSS, JS compression and setting import export at one place. To extend appearance of website, JD LawX comes with two layouts: Dark Layout and Light Layout. Furthermore, You are free to choose different typography for body, Headings, or Navigations. You can set different font families, font sizes, font weight, style and subsets as per your requirements. Currently, JD BizX is on sale for $39 at JoomDev. With that, you will get future updates and 6 months support ftom the theme developers. You can also download the free version before you buy. Once your payment is complete your account is immediate active, this generally takes less than a minute to occur. JD BizX comes packed with quickstart package with demo data installer (Joomla 3.8, recover template, used extensions, demo content – all included). Once you install the quickstart, you’ll have a replica of the live demo. JD BizX is a flexible responsive Joomla creative multiuse one page and multipage template. Resourcefully set of tools for the intuitive development of beautiful. With the plentiful functionality offered by dozens of custom shortcodes. 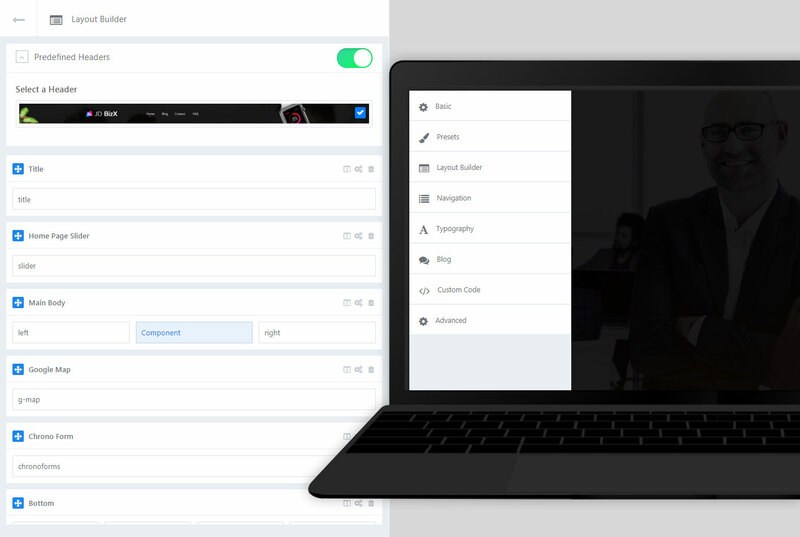 Combined with a powerful drag and drop page builder. As well as an impressive set of admin panel tools that empower you to command total control over the look and feel of your every page, section and element with total ease and simplicity, requiring absolutely no coding. Let JD BizX take your business to the next level!